Unlike many building materials and techniques, concrete pouring is a task for a skilled laborer. Even when your concrete professional knows his trade, environmental and soil conditions can contribute to a concrete job gone wrong. Concrete is very unforgiving and responds quickly to changes in the immediate area. 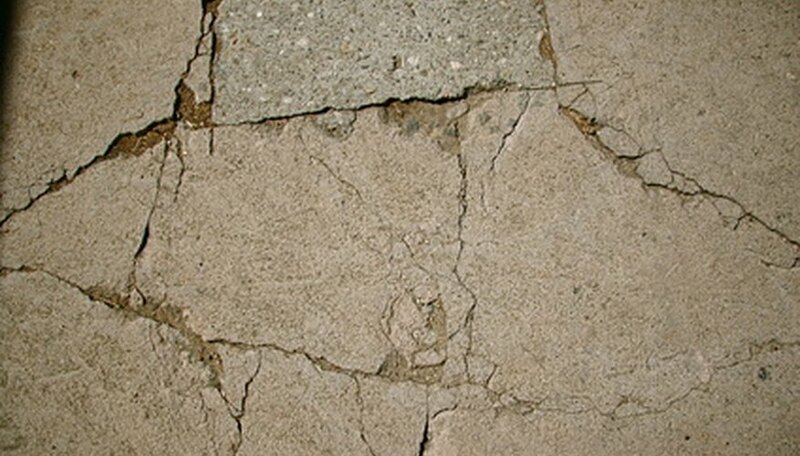 The techniques and products used to fix a concrete job that has been messed up will depend on the type and extent of the damage that was done. Hire a structural engineer and a geologist to determine if the messed up concrete is due to problems with the building or with the surrounding soil. Fix any issues that are found, including uncompacted soil or a faulty foundation. Stabilize the soil in the area immediately around the affected piece of concrete. Drill a series of 2-inch holes around the edge of the messed up and cracked concrete, placing the holes at 1.5- to 2-foot increments. Fill with small gravel. Place a soaker hose above these holes and let the water funnel down for at least 24 hours. Repair any significant cracking on the concrete using a concrete repair kit. Inject the concrete epoxy into the cracks following the instructions included with the kit. Allow the epoxy to dry and cure completely. Wet the concrete with a fine mist of water from a garden hose. Spread a thin layer of concrete mix over the entire top of the concrete. Mix Portland cement and fine sand in a 1 to 2.5 ratio. Thin with enough water to make the mixture spreadable but still firm enough to stay on the surface of the concrete. Spread this concrete mix on the entire surface of the messed up concrete and move it around with a concrete trowel until the surface is covered and evenly coated. Allow the Portland cement mixture to dry completely before you walk on the concrete. If the concrete is flaking, but not cracked, skip to Step 4 and continue from there. If the concrete is severely damaged, possibly with large pieces breaking off, it may be necessary to entirely remove the messed up concrete with a backhoe or jackhammer and start from scratch. If you do remove the concrete, soil stability issues can be fixed with water and a portable compactor. It is advisable to get a compaction test before you attempt a new pour. Work quickly after the Portland cement is mixed to avoid further damage to the concrete. If you do not remove snow from the surface of your concrete drive or sidewalk regularly, it will not adjust to the temperature change properly and will be much more likely to develop a damaged or "spalding" surface. This does not indicate a defective concrete job nor a poorly skilled contractor.